I had a fortunate encounter recently, one that brought the memories from a memorable and mystic Haida Gwaii summer adventure to the forefront of my afternoon. Haida Gwaii means island of the people, as Haida translates directly to “us” or “people”. Rosespit, the most northeastern tip of Graham Island is where the raven discovered and freed the people of the earth from a giant clam shell, you can see Bill Reid’s depiction of this fable on any twenty dollar bill or in person at the YVR airport . The islands before colonial contact were originally called Xhaaidlagha Gwaayaai which translates to “Islands at the Boundary of the World”. You have to visit to understand how the original people of this place could give it that name as this translation is not far off. The island sits atop a massive fault line that plunges deep into the Pacific. The Haida used to find massive dead sea turtles the size of cars washed up on their beaches, evidence of a bountiful and divine unknown beyond their earthly boundaries. These sea turtles used to gain great bulk from riding currents and foraging on Jellyfish blooms. In fact some scientists claim that large amounts of turtles that are killed as by catch of commercial fishing vessels (Gill Nets and drag nets, and all the turtles dying from mistakenly eating too much plastic), are part of the reason why there are such huge blooms of Jelly fish now being experienced in the sea. The divinity and wealth of the origin of these massive sea creatures was and still is invoked in Haida culture and art. Those familiar with such art will have seen the door keyhole shape, often utilized in Haida made earrings, broaches, or in paintings, this shape originally was adopted within the Haida art as it was the symbol upon the foreheads of these great sea beasts whom washed upon their shores. The shape was associated with wealth, and was prominent in potlatches, as a cooper shield shaped in that symbol would be broken and shared among the guests. Anyways I digress, this story is about a white raven, not Volkswagen sized turtles. 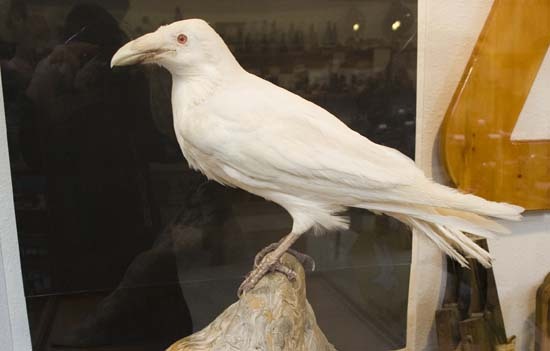 A white raven whose tale is entwined indirectly with the tragic story of the Golden Spruce, considered an Arbor Miracle, was cut down by an environmentalist named Grant Hadwin, who cut it down as a protest against the logging companies that stripped the Haida Gwaii of almost all its old growth forests, leaving the stand around the Golden Spruce as its only, and measly commitment to conservation in that area. So his protest was like, “What the Hell you guys, you chopped everything else down, why stop their jerks.” It was a misguided and misunderstood protest by a man who had perhaps started to lose his train of thought , as losing such things as a train of thought tend to happen. What a great saying “Train of Thought”. Shortly after the tree fell, the white raven flew into power lines and died. Albinism in Ravens is rare but does happen, what is really rare is that it survives its developmental stage, as such visibly different traits in youngsters provokes the negative attention of its siblings and often ends with such differences resulting in assault, death or starvation. Albino human beings experience the same hostility from their more median brothers in Tanzania and other superstitious areas of Africa, where Albino body parts are highly valued for Black Magic potions. Basically an Albino Raven must be the only egg that hatches, or other extenuating circumstances for it to make it to adulthood. So when that anomaly of a bird died it was thought to be the last in most peoples lifetimes... or was it?